Garrett Casto (center) signs his letter of intent to play football for Otterbein University while his parents watch. 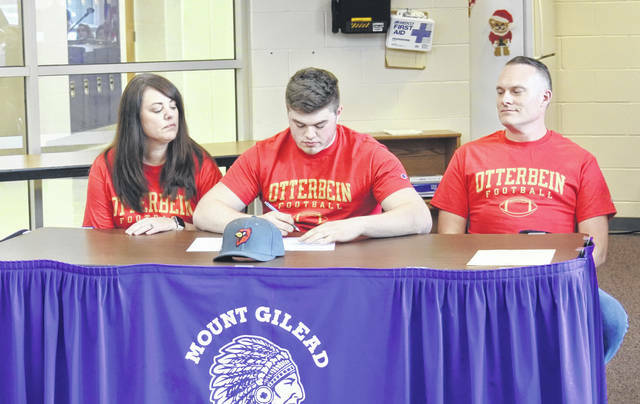 After a senior season that saw him named a second-team all-KMAC player, Mount Gilead’s Garrett Casto will continue playing football for Otterbein University. Casto noted that his college search only took a couple months before he decided upon the Cardinals. Casto, who will major in business, said that he really enjoyed Otterbein’s campus, as well as the city of Westerville. He also liked how close the school was to home. It also didn’t hurt that the football staff liked what he brought to the table. “They’re building their program, so they needed guys with good attitudes and they liked that about me,” he said. While Casto was a two-way player at Mount Gilead, he will focus on defense while with the Cardinals — just what he wanted to do. When he arrives on the Otterbein campus, Casto is expecting tough competition to earn a spot on the field. “Obviously, there will be better players than here, so I’ll have to work harder and set higher goals to play and start there,” he said. Casto noted that he’ll miss his friends when he goes to college, but is looking forward to the new experiences that college life will bring.